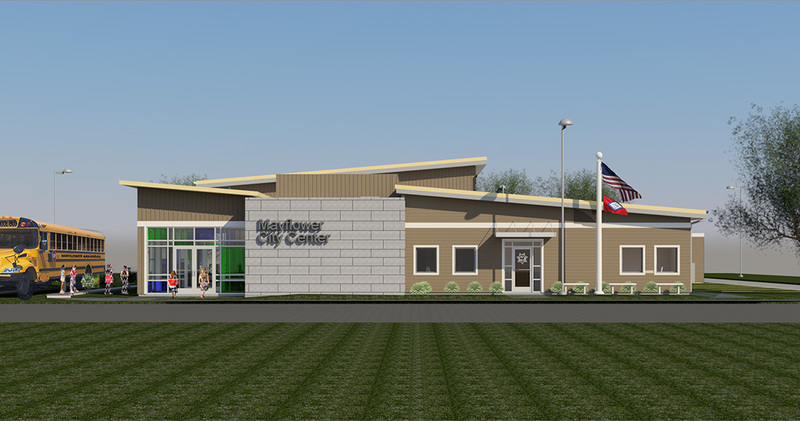 The site is located in the current civic district of Mayflower, adjacent to the Mayflower School District Administration office, elementary school to the south, and a senior living center to the north. Both neighbors will be connected to the site through accessible pedestrian paths. The site plan will have a “water-wise” demonstration area and a demonstration pond, outdoor educational pavilion, and an environmental education/event space. The site parking and drives will be composed of pervious concrete and will include storm water filtering systems abutting the existing and surrounding paved areas. All of the plumbing fixtures will be low-flow fixtures. The use of natural daylight, insulated glazing, and heightened insulation will help to reduce energy consumption. Information about these features will be programmed into a touchscreen display and will be accessible to the public. The building will also be linked to remote live web cameras placed around Lake Conway and the watershed to allow day-to-day nature observation that would be otherwise inaccessible. These web cameras will also be accessible through touchscreen displays incorporated into the design of the facility. The “water-wise” living laboratory consisting of a water feature that emulates the wetlands surrounding Lake Conway will allow the public to study regional plant and wildlife through a hands-on approach in a kid-safe environment. Roof water from an outdoor classroom/pavilion will be collected to irrigate the laboratory. This feature will exemplify water collection, conservation and natural purification. The site plan contains multi-function features. It will contain the aforementioned environmental education features, but it will also serve as an event space. The green space to the east of the building will be graded in a way to drain to the demonstration pond when it rains, and it will be landscaped to allow for amphitheater type seating. The pavilion that will be the day-to-day unloading zone for school children and the first point of the environmental education, will also serve as a back drop and a stage facing the green space seating.